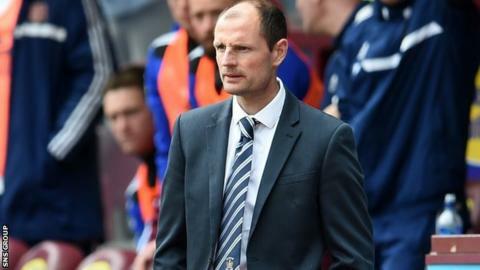 Allan Johnston will stay on as manager should Kilmarnock face a relegation play-off, according to his chairman. Killie are second bottom of the Premiership with two games remaining. "We don't see any reason to change things at this stage of the season," Michael Johnston told BBC Scotland after Killie's annual general meeting. "He has a tough job and he has two very big games coming up but we are still in there. We still have a chance of finishing seventh if we get two wins." Killie, who are home to St Mirren on Wednesday and away to Hibernian on Saturday, have lost 21 of their 36 league games, including their last four outings. However, the Ayrshire side are just two points adrift of Hibs in eighth place in a congested bottom half of the table. There is every reason to think that we would come out on top if we did face a play-off over two legs." Following Sunday's 5-0 drubbing at already-relegated Hearts, manager Johnston said "there has to be a reaction", adding: "We need big performances and I believe we have the players that can do that." Around 500 shareholders were in attendance at the AGM, with both Johnstons facing some hostile questioning. "You could see the passion of the supporters and how desperate they are for the club to do well - and I'm the same," the manager told BBC Scotland. He described banners calling for his sacking at Tynecastle as "disappointing", going on to say: "The main thing is supporters need to get behind the team. We need their backing in these vital games." Johnston, who is to relinquish his chairman's position at the end of the season, but stay on in a prominent role, remains confident he has chosen the right man to lead the team. "Allan Johnston was the PFA Scotland manager of the year last year and had great success with Queen of the South," he explained. "It's been a difficult introduction to Premiership football for him but I can tell you he has big plans for changing the squad for next season. "The main objective is to avoid the play-off but if we can't we will go into that positively as well. "We have a strong squad of players with real experience and quality and promising youngsters coming through. There is every reason to think that we would come out on top if we did face a play-off over two legs." Kilmarnock last played in the second tier in season 1992/1993 and the chairman, while confident of avoiding relegation, was sanguine on the prospect of the drop. "The financial consequences are nowhere near as severe as they were in the past," he said. "We are basically debt free, so we are in a much stronger position. "Also, league reconstruction last summer means the Championship is financially a much healthier place to be. "And then there is what's called the "super-parachute" payment of £500,000 in the first year and £250,000 in the second year for club 11, if relegated." The AGM revealed that Kilmarnock were heading for a £730,000 net loss before a reconstruction deal was put in place to eliminate the club's debt.